The 2006 Durham Bulls finished the season 15½ games behind the Charlotte Knights. The year served as a pause following the Bill Evers years (1998-2005, 613 wins). John Tamargo was the manager of a team that struggled to deal with some very difficult personalities including B.J. Upton, Delmon Young, and Elijah Dukes. It was my first year watching the Durham Bulls. I wasn’t sure I’d be coming back. And I didn’t have a clue about how important the manager is to a Triple-A team. Tamargo moved on and Charlie Montoyo was promoted up from the Montgomery Biscuits. 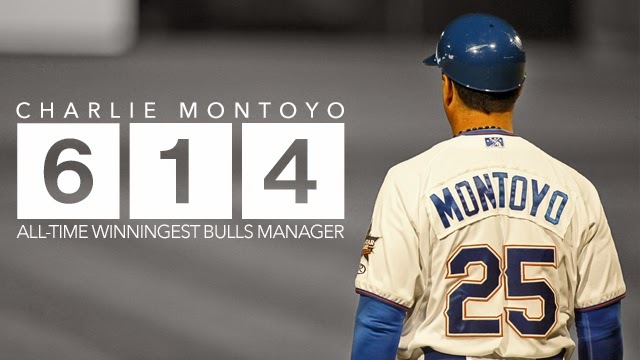 In 2007 he began his extraordinary run as the manager of the Durham Bulls that reached 614 wins last night. Just a short list of some of the ballplayers he’s managed is a testimony to a man doing his job — getting players to, or back to, the major leagues. Among them would be: Elliot Johnson, Evan Longoria, Justin Ruggiano, Ben Zobrist, Jeff Niemann, Andy Sonnanstine, Mitch Talbot, Dale Thayer, Ried Brignac, Jonny Gomes, John Jaso, Dan Johnson, Grant Balfour, Wade Davis, Scott Kazmir, David Price, Desmond Jennings, Joe Bateman, Jose Lobaton, Dioner Navarro, Jeremy Hellickson, Tim Beckham, Brandon Guyer, Stephen Vogt, Chris Archer, Alex Cobb, Dane De La Rosa, Brandon Gomes, Dirk Hayhurst, Jake McGee, Matt Moore, Ryan Reid, Cory Wade, Matt Joyce, Hideki Matsui, and many, many more who pitched or got at bats in the majors after passing through Durham. That’s quite a list and one he should be proud of, along with all the South Division titles. Manager of the Year awards, and more. As we’ve written elsewhere, as wonderful as the Governors’ Cup championship is, the true measure of an International League team is the Division championship. And he's won it almost every year he's been managing the Bulls. 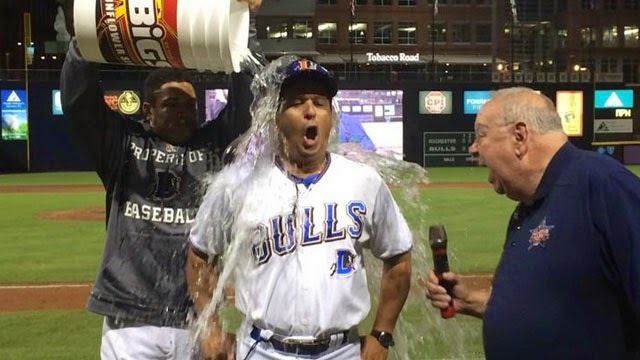 For a closer look, see Bull City Summer or John Feinstein’s Where Nobody Knows Your Name for insights into the challenges of Triple-A management. In the meantime, let me just add my congratulations and thanks. Every time Charlie makes his run down the third base line to take up his position in the coach’s box I think we’re ready to win another game. Last night we did. For more, check out this and this.